Seven hundred demonstrators picketed the Port of Oakland near dawn Sunday morning, protesting Israel’s attack on a flotilla trying to break the blockade on the Palestinian territory of Gaza. 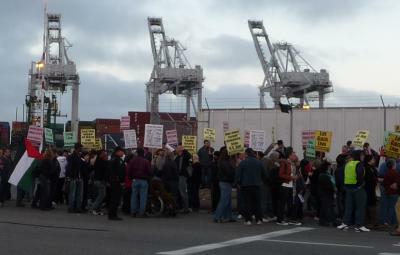 Longshore Workers Local 10 honored the picket and refused to unload a ship bearing Israeli cargo. Photo: Mike Parker. Bay Area dockworkers refused to cross a picket line early Sunday, leaving a ship loaded with cargo from Israel floating offshore. Seven hundred demonstrators had gathered to protest Israel’s May 31 attack on a flotilla attempting to break the blockade on the Palestinian territory of Gaza. The assault on the flotilla, carrying 10,000 tons of aid, killed nine people and injured more than 100. After members of Local 10 of the Longshore and Warehouse Union (ILWU) chose not to cross the line at the Port of Oakland, citing a contract provision that protects their health and safety, the stevedoring company cancelled the next shift, anticipating another refusal to unload the ship. The events followed a similar action by dockworkers in Sweden, responding to the call put out by the Palestinian General Federation of Trade Unions (PGFTU) to turn away Israeli goods. Dockworkers in Norway, Malaysia, and South Africa have also said they will not unload Israeli ships and cargo. The call for longshore unions to refuse Israeli goods was amplified when Israel dispatched commandos in helicopters three weeks ago to seize small ships that were attempting to break the Israeli blockade of Gaza. The humanitarian mission was sponsored by Turkish organizations, and hundreds of unarmed activists were on board. Israel has prohibited food, household goods, and construction materials from reaching Gaza since the 2006 election of the militant Hamas movement to the territory’s government. Israel, under heavy international pressure since the deadly assault on the flotilla, announced Sunday it will widen the list of goods allowed into Gaza. Israel’s three-year blockade—and a 2008 military assault on Gaza that killed 1,440 Palestinians and destroyed 4,000 homes along with hospitals and water treatment facilities—has left the tiny territory in ruins, unable to rebuild. Along with US Labor Against the War, Labor for Palestine, a small US-based cross-union network, decried the assault on the flotilla. The AFL-CIO declined to comment. Meanwhile, the South African Municipality Workers, among others, is campaigning to have cities break ties to Israel. Their drive is part of the international Boycott, Divestment, and Sanctions movement, which activists in many countries are taking up to pressure Israel to change its behavior toward Gaza and its own Palestinian citizens. The campaign is modeled after the international movement that brought down South African apartheid in the 1980s. Palestinian labor is asking for union solidarity in the campaign to sever ties with Israeli businesses, and to support new flotillas attempting to bring essential goods into Gaza. Bay Area dockers refused to unload a South African ship in 1984, and would not load bombs headed for Chile’s military government in 1978. National Labor Assembly: An Advance for Opposing the War in Iraq! The National Labor Assembly convened by US Labor Against the War (USLAW) was a very important development despite some weaknesses which we hope will be corrected. There were about 200 participants representing 94 local unions, state organizations, central labor councils allied national unions and worker organizations. This was an impressive turnout, especially since the historical record of the AFL-CIO around wars, has been to support the US policies, as were done doing the Vietnam War and those prior. The Mission Statement addresses a number of concerns centered around the US war against Iraq in particular and US foreign policies. It also addresses the “war at home”-the impact of the war in Iraq on the conditions of working people in the US, including workers, immigrants and communities of color. help them impact on shaping the reconstruction and direction of Iraq, which US corporate power led by the Bush administration is currently dictating. The other reason, is that many of the major US corporations who have contracts to “rebuild” Iraq, are the same ones who exploit and try to bust the unions of workers inside the US and internationally. USLAW is operating on the principle of international labor solidarity. This USLAW formation has the potential to influence the direction of the AFL-CIO around the continuing US war and occupation of Iraq. The AFL-CIO took a lukewarm position calling for the US to seek support from the UN and international allies before going to war; which in essence, was not really in opposition to the war. This has been the stand of many in the Democratic Party, to give the impression that they are opposed to the war and different from the Republican Party, who make no bones about being in favor of the war. USLAW has been very careful not to take positions they feel would not be supported by the AFL-CIO bureaucracy, which in the short term may be tactically necessary; but becomes problematic as USLAW sets itself out as being a voice for labor on US foreign policies. The obvious silence on the Palestinian struggle in the decisions at the Assembly, reflect a serious weakness USLAW and the unions which has to be overcome, if the US labor movement truly wants to deal with the problems of US foreign policies in the Middle-East. Defending Social Programs and the Public Sector: Will publicize what the $87 Billion could buy at home, do teach-ins and actions such as on tax day, and do community forums with votes on supporting social programs and defending public services and the workers who provide them. Defending Civil Liberties and Labor Rights: Will act as an information clearing house on the web site and will work against the Patriot Act and in defense of labor rights in the U.S.
Labor Veterans and Military Families Against the War: Will reach out to and involve union members and retirees who are veterans or members of military families, set up a speaker’s bureau, participate in a March 20th national anti-war event and fight for vets benefits and rights. Defending Immigrants and Communities of Color: Will highlight military recruitment of high school youth during Black History Month, focus on unjust incarceration and work for amnesty for immigrant workers. It will help mobilize labor’s response to discrimination and harassment based on race, ethnicity, religion, or gender. Popular Education and the War Economy: Will develop materials for trainings and coordinate among people wanting to promote and lead educational workshops that make the connection between U.S. foreign policy, a militarized economy and budget, and the impact they have on workers, jobs and communities. Interested labor organizations are encouraged to host and organize a workshop available from United For a Fair Economy, in conjunction with USLAW, for officers, staff and members. International Solidarity and Labor Rights for the Workers of Iraq: Proposed activities to promote the right of Iraqi workers to organize in the unions of their choice, and to educate the labor movement and the public about the conditions Iraqi workers are facing under the US Occupation. It will help mobilize labor solidarity with workers in other countries who are affected by U.S. foreign policy and military action. The Assembly was highlighted by presentations and slide show by Clarence Thomas of the ILWU Local 10 and David Bacon of the Newspaper Guild on their trip to Iraq in October as part of an international delegation and by Bill Fletcher, Jr. head of Trans Africa Forum and long time labor activist, who spoke about the history of labor and US foreign policy. Even though the participation of workers of color at this Assembly increased from the first USLAW meeting held in January, the numbers were still low. This is also true for the composition of the Continuations Committee which serves as the USLAW Coordinating body. The Southern region was also under represented at the Assembly. Only 3 of the 19 states represented were from the South-North Carolina, Florida and Kentucky. Black Workers For Justice had representation at the Assembly and has a member that sits on the USLAW Continuations Committee.